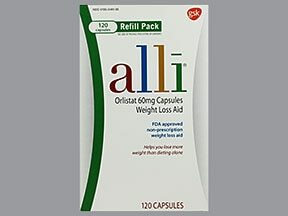 Note: GlaxoSmithKline (GSK) Consumer Healthcare has voluntarily recalled all of its nonprescription weight loss drug alli from retailers in the United States and Puerto Rico because the bottles may have been tampered with. What conditions does Alli treat? List Alli side effects by likelihood and severity. Before using this medication, tell your doctor or pharmacist your medical history, especially of: a certain digestive problem (chronic malabsorption syndrome), a certain gall bladder problem (cholestasis), underactive thyroid (hypothyroidism), kidney stones/problems (such as calcium oxalate kidney stones, hyperoxaluria), certain eating disorders (anorexia nervosa/bulimia), HIV infection, seizures. What should I know regarding pregnancy, nursing and administering Alli to children or the elderly? Some products that may interact with this drug include: "blood thinners" (such as warfarin), HIV medications (such as atazanavir, efavirenz, emtricitabine, lopinavir, ritonavir, tenofovir). Does Alli interact with other medications? Do not flush medications down the toilet or pour them into a drain unless instructed to do so. Properly discard this product when it is expired or no longer needed. Consult your pharmacist or local waste disposal company for more details.Information last revised September 2016. Copyright(c) 2016 First Databank, Inc. This medicine is a turquoise, oblong, capsule imprinted with "Orlistat" and "60". Have you ever purchased Alli?